Makepeace, Bernice: Who was the Black Sheep of our Family? Who was the Black Sheep of our Family? Fortunately growing up, I knew my Dad’s side of the family fairly well. I knew all of my Dad’s brothers and his sister. Dad had five brothers and one sister, and needless to say many nieces and nephews. Our Nelson family was the family with many Berts: Herbert, Wilbert (my Dad), Robert, and Gilbert, plus Wilkie and John. Over the years I met all of my first cousins except one – Everett. He was the oldest son of Gilbert Nelson. 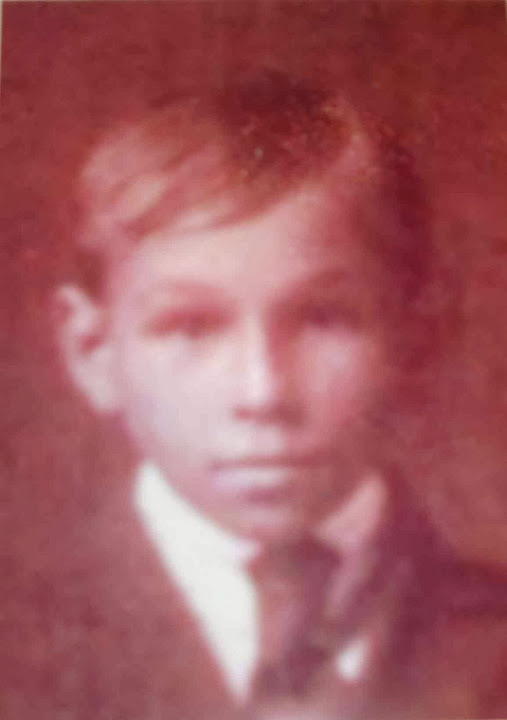 Everett Nelson at about 12 yrs. Gilbert and his family lived in Warkworth, where Uncle Gil owned and operated the butcher shop. His family consisted of Everett, Hayden, Cecil, Marguerite and Doris. Gil’s wife was expecting a baby in 1924 and unfortunately both mother and baby died. The children were quite young and the oldest Everett was only 12 at the time. The youngest, Doris (only 3 years) was sent to live with her mother’s sister. Uncle Gil moved to Toronto in a few years at which time Doris (now 11) came to live with us. Because of this we saw a great deal of Hayden, as he and my brother Art were the best of friends. Cecil and Marguerite were also familiar faces and Uncle Gil would make his yearly appearance. As for Everett, I never saw him and this is the one cousin who I believe appears to be the black sheep of our family. Everett had gone to Toronto and lived with his Dad for a short time. He soon married and became the father of a daughter, Lenore, and a son, Everett. When his children were 3 and 2, Everett walked out one morning and was never seen again in this house. Everett (the son) grew up and married. He and his wife had 3 sons. The second son was called Michael (Mike), who is the one that discovered what happened, to his grandfather. Mike and his brothers were never allowed to ask questions about the grandfather. This might have been for several reasons, but no one in the family had any good memories about the grandfather, Everett. As Mike grew older, he wanted to know something about this man. He started to do some research but had little luck. Eventually Mike learned the identity of some of his cousins from a girl at his work place and he and I finally connected. When Mike called me and said I was a relative of his, I told him there was no Michael in the Nelson family tree, which I had been working on for several years. He mentioned his grandfather’ name and I said yes there was an Everett Nelson in my family but that I knew little about him as he disappeared years ago. I passed on what information I had about Gilbert’s family. As well I gave to Mike information about Everett’s sister, Marguerite, where she now lived and her address. From this information, Mike contacted her and made the trip to Florida. From her, many missing pieces were filled in. Marguerite told him that when her brother walked out that morning, Everett went to Brantford. Here he changed his name but she couldn’t remember it as she always called him Everett. Over the years, she and other brothers as well as her Dad had gone to Brantford to visit Everett. When questioned about the reason Everett had walked out and deserted his family, Marguerite didn’t really know except to say he was a very unhappy man. Marguerite talked about their early childhood and showed Mike many family pictures. The last picture she showed Mike was one of her brother, Everett, taken shortly before he walked out on his family. It was a picture of Mike’s Dad and Aunt. Marguerite had attended Everett’s funeral in Bradford and Everett’s wife, Mae, had given the picture to Marguerite. Mae told Marguerite that Everett carried this picture in his wallet all the time. Mike returned home, but didn’t tell his father about what he had learned. Mike now had a greater desire than ever to find out more about his grandfather. He went to Brantford and used the library there. Marguerite had told him that his grandfather had died on Halloween and the year of his death. At the library, Mike checked out the obits for that date and found four men had died that day. One of those names had to be his grandfather. One name caught Mike’s attention – George Allan. The funeral director was mentioned in the obit and so Mike headed there. The funeral director was willing to look up the data they had on George Allan. When he opened the file, the funeral director commented, “This is odd. George Allan’s parents do not have the same last name”. When Mike was told the name of the parents, he knew he had at long last found his grandfather. When Mike visited the cemetery, he found the tombstone with the name George Allan on it. Did Mike stop his search for his grandfather at this point? Of course not. In the obituary, George’s home address had been given. Mike found the house and decided to see if the people in it might have known his grandfather. He knocked on the door and asked the person if he knew George Allan. Mike was told that he didn’t, but the man next door might as he was a long-time resident on the street. When Mike knocked on this door, a woman answered. She would not let Mike talk to her father as he was now 90. When Mike told her why he was there she invited him in and told Mike what she knew about his grandfather. This woman remembered George quite well. She stated that George was a very grumpy person but that his wife was a pleasant woman. George had had a produce store downtown. Mike mentioned to this woman that he knew his grandfather was a “lover of spirits”. The woman looked relieved and then continued to tell Mike that this was what had eventually killed him. The woman stated that George and Mae Allan had no children, also that Mae died just a few years after George. Mike now felt that he could stop searching for any more information about his grandfather. This information Mike had learned was now passed on to me. The information certainly filled in what I knew about Everett Nelson, oldest son of Gilbert and Jessie Nelson. What would you call a man who walks out on his wife and children and changes his name? To me he is a black sheep of our family. Northumberland Today columnist, Cecelia Nasmith, incorporated Bee's story with two others, perhaps to strike a contrast, under the headline "Professional success is worth celebrating" in the 28 Feb 2013 edition. It can be read online at NorthumberlandToday.com.